Edie Robbins, of the Big Cypress Reservation, won first place in the Engineering category at the Heartland Regional Science and Engineering Fair on Feb. 14 in Avon Park. 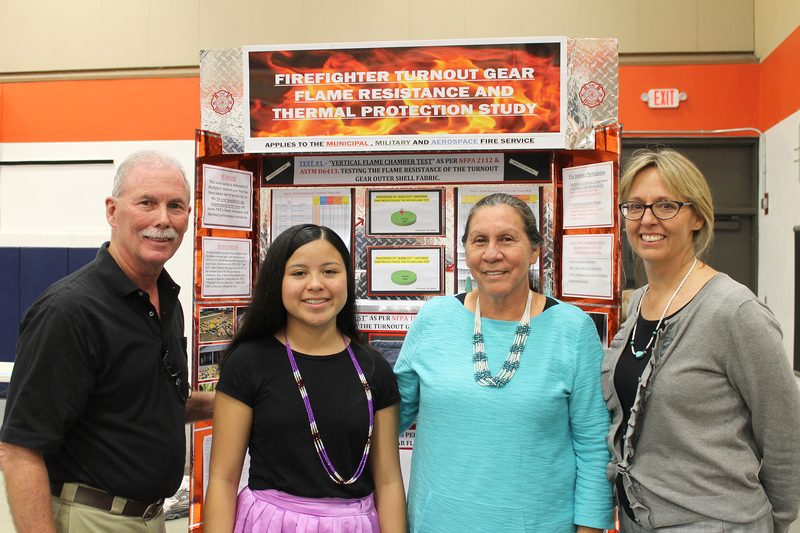 Middle school and high school students from DeSoto, Glades, Hardee, Hendry, Highlands and Okeechobee counties competed in the fair. Robbins is a ninth-grade student at Clewiston High School. She was awarded for her work on a study – which took 10 months to complete – about firefighter turnout gear flame resistance and thermal protection. The basis of her study was to substantiate if after 10 years of active use is turnout gear deemed unsafe for use. Fire departments retire turnout gear after 10 years. Halfway through the study Robbins learned that North Carolina State University had a textile laboratory – the only independent textile laboratory in North America – that tests new fabric samples for manufacturers of turnout gear. Robbins contacted the university to ask for assistance in her study the university expressed that they had always wanted to do such a study and accommodated her request by testing some samples of the used turnout gear she had acquired. The university did $3,000 worth of testing for free. Robbins’ study concluded that age was a factor when it comes to performance of turnout gear. The older turnout gear becomes less reliable in terms of flame resistance and thermal protection. Robbins received letters of recognition from the National Fire Protection Association president and CEO Jim Pauley as well as the International Fire Chiefs Association, Metropolitan Fire Chiefs Association, and the Centers for Disease Control and Prevention. All of these entities have input in making the standards that fire departments must adhere to in order to be compliant with fire codes. “To our knowledge your work is the most comprehensive to date.” Chief Otto Drozd, president of the Metropolitan Fire Chiefs Association, wrote in a letter to Robbins. 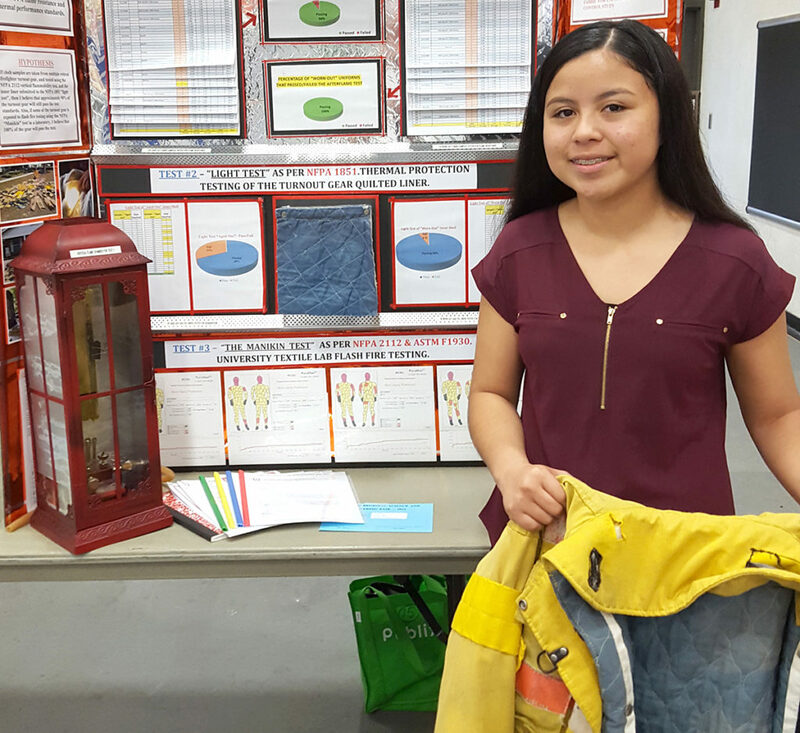 She received five additional awards: the United States Air Force Award, the ASM Materials Award, and the Florida Association of Science Teachers Award, and a nomination to represent the Heartland region at the Florida State Science and Engineering Fair to in Lakeland. Robbins was also selected as one of two senior division students to represent Florida and the U.S. in the Intel International Science and Engineering (ISEF) to be held in Phoenix, Arizona, in May. ISEF is a program of Society for Science & the Public and is the world’s largest international pre-college science competition. “We’re all very proud of her,” Monroe said.